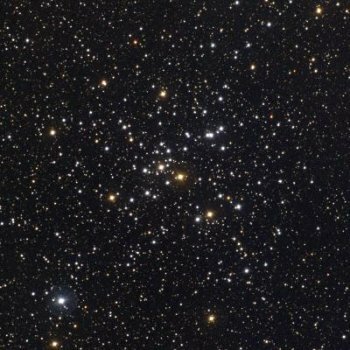 M41 (NGC 2287) is an open open cluster (Trumpler class I, 3, r) that lies in the constellation Canis Major, about 4° due south of Sirius. M41 is approximately 200 million years old. It contains about 100 stars, including several bright red giants, the brightest of which is of spectral type K3 and mag 6.9, and situated near the cluster's center. The bright star in the southeast corner (lower left) of the accompanying image is a foreground blue giant, not part of the cluster. M41 was discovered by Giovanni Hodierna before 1654, although it has been suggested (by J. E. Gore) that it was known to Aristotle about 325 BC.